Born and raised in Farmington Hills, MI and later Midlothian, Virginia, Akash Raje is a rising fourth year at the University of Virginia double majoring in African American & African Studies and Foreign Affairs. Influenced by his upbringing in Metro Detroit's vibrant cultural communities, Akash is interested in studying the Indian American identity and multiculturalism in the United States. He spent last summer in rural Maharashtra, India teaching math, reading, and writing to children at Snehalaya NGO. 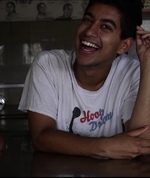 At the University of Virginia, Akash is active in music and community building, serving as the President of the Student Hip Hop Organization and as a DJ for WXTJ Student Radio. He also works with the Inter-Fraternity Council and UVA Multicultural Student Services to pursue opportunities for inclusion and empowerment of minority students. At his core, he is a lover of music and believes in the power of music to build compassionate communities.